Happy Friday, everyone! Sorry my post is late today....I took my little one out with some of her friends for a birthday celebration. 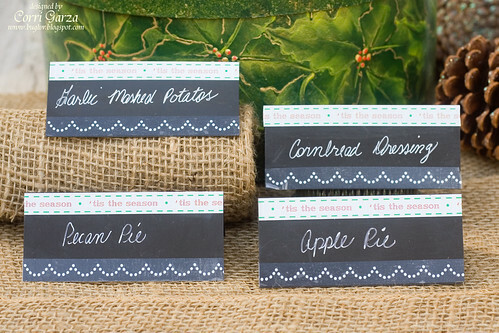 I have another quick and easy set of buffet markers for you today. I trimmed and scored some chalk stock from Canvas Corp. to make these look like little chalk board and dressed them up with some stickers from SRM. You can read all the dimensions and get more details over on the SRM Stickers Blog.